With rain falling almost all-year-round and the thermometer barely going above 70, it takes a brave man to buy a convertible in the UK. The UK&apos;s Auto Trader magazine recently conducted a survey that revealed the nation&apos;s top ten open-top motors. According to The Telegraph that shared the results of the survey, it appears that once you drive with the roof down, there&apos;s no going back to the hardtop: 95 percent of the 1,265 convertible owners polled claimed they would be buying another. Volkswagen gets the ball rolling in tenth place with the Golf Cabriolet. Mk1 Golf Cabriolets are now considered classics, while the Mk6 represented the first roofless Golf since 2003. Sporting an updated front fascia, LED daytime running lights and a pulled-back windshield, its new styling has been very well received across European markets. Ninth spot goes to the Lotus Elise. Considering early models can be snapped up for around £5.5k, we&apos;re not at all surprised to find this car on the list, even if they are a pain to get in and out of. Arguably the best value of the best handling cars in the world and still one of the most exciting cars to drive on the road. Audi&apos;s TT Roadster is in eighth place. The car first went on sale in 1999 and the second-gen TT introduced in 2007. Based on the Golf&apos;s chassis, the TT may have the looks and the luxury interior but its certainly no knee-trembler. However, with models now going for as little as £3k, you won&apos;t find too many people complaining. In seventh we have the BMW 3-series. 1980s models start at a few hundred pounds, with the latest version of the full four-seater convertible ranging from £10-£35k. So there&apos;s a model to suit all budgets. And then there&apos;s the M3; seriously quick, seriously expensive to run. The front-engined Ferrari California, in sixth, was launched in 2009 and is Ferrari&apos;s first convertible with a folding hardtop. A sweet sounding 453hp 4.3-liter V8 engine ensures that even with relatively bland looks, used examples of Ferrari&apos;s supposed entry-level model still command prices of around £120k. Mazda&apos;s two-seater MX-5 roadster heads up the top five, with early models going for around £500. Front-engine, rear-wheel-drive and beautifully balanced, whatever version you drive it will handle superbly. Fourth spot is reserved for the Porsche 911. The 2012MY is now on sale and boasts an all-new lightweight hood and new high-tech aluminum-steel body that makes it much lighter than its predecessor. £80k will get you the 345hp 3.4-liter inline-six Cabriolet, and for an additional £10k the Carrera S delivers around 400hp and tops out at 187mph. In third the Jaguar XK is more laid-back but its 5.0-liter V8 makes it almost as potent. Running costs are no joke but if you&apos;re happy to go for an older model, you&apos;re looking at a subcompact budget for a supercar. Second place goes to the Mercedes-Benz SL, which celebrates turning 60 this year. The new SL500 boasts a 4.6-liter twin-turbo V8 that develops 435hp and 516lb-ft of torque. Stylistically it oozes class and is ideal for a cruise as well as the occasional thrashing. 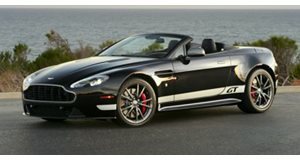 Top of the pile and the most popular convertible is the Aston Martin V8 Vantage Roadster. One of the most beautiful cars on the road, its fabulous 4.7-liter V8, designed with the convertible in mind, delivers just as good performance as the coupe and copious amounts of aural pleasure with the roof down.